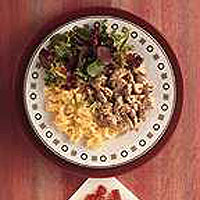 Stroganoff is a classic dish named after the 19th-century Russian diplomat Count Paul Stroganov. This recipe uses Waitrose Mini Diced Steak which contains less than 10% fat. Look out for the Diet Choice symbol on our packs. Serve with fresh pasta and a mixed salad. Toss the steak in the black pepper and mustard seeds. Heat 2tbsp of the olive oil in a heavy based frying pan until hot then cook the beef for 5-6 minutes until browned and thoroughly cooked. Remove from the pan and keep warm. Add the remaining olive oil and cook the mushrooms for 4-5 minutes, until soft. Add the brandy and boil gently for 1 minute, then add the crème fraîche and simmer briskly until thickened. Stir in the wholegrain mustard and 2tbsp of the tarragon. Season with salt and freshly ground black pepper. Return the beef to the sauce and bring to the boil. Serve with the cooked pasta and garnish with the remaining tarragon. This recipe was first published in Mon Feb 01 00:00:00 GMT 1999.